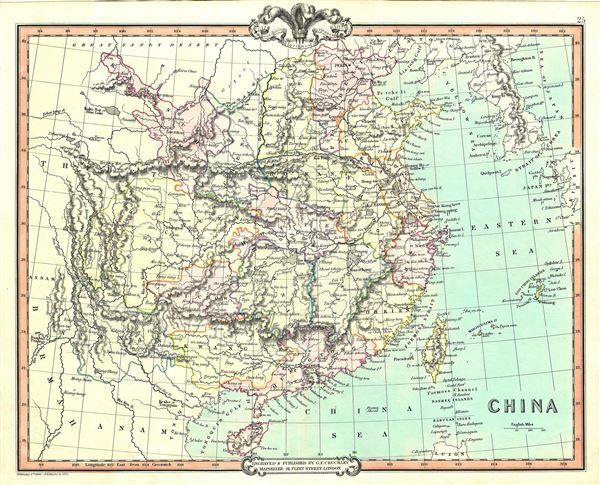 A lovely 1852 map of China by George Frederick Cruchley. It covers the traditional provinces of mainland China, as well as adjacent Corea (Korea) and Formosa (Taiwan). Hong Kong Island and Macao are identified. The Grand Canal is also noted. Throughout, the map notes several towns, cities, rivers, lakes, mountains and a host of other topographical features. The map is color coded according to countries and territories, and elevation is rendered in hachure. During this time in history, this region was dominated by China's last Imperial Dynasty, the Qing. In 1851, a year before this map was issued, the region dissolve into one of the bloodiest wars in human history, the Taiping Rebellion against the Qing, lasing from 1851 and 1862, and costing more than 20 million lives. Around the same time Second Opium War or the Arrow War, from 1856 to 1860, would result in China's concession of Tientsin and Hong Kong to the British. Very good. Minor wear over original centerfold. Blank on verso.